Place the loop on the halter through the loop on the lead rope. 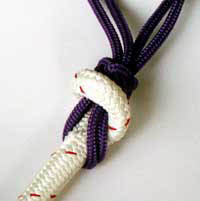 Place the end of the lead through the loop on the halter. 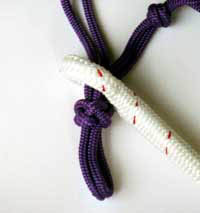 Pull the rope through and tighten the loops snugly against each other. I don't tie my horses. 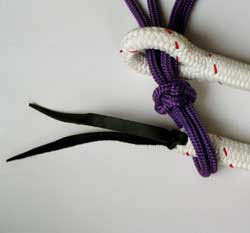 I wrap the rope three times around a solid, smooth hitching rail with a large diameter. If my horse pulls back there is drag on the rope without anything solid to pull against. The horse feels resistance without being able to set back and really pull. I don't leave my horses for long out of my sight because they can pull the rope loose and wander off with the rope hanging down. In preparation a horse must become accustomed to ropes around its legs so that it doesn't get frightened and run off with the rope whipping around. You can begin by allowing the horse to be free in a small space with the rope hanging loose. A Natural Horsemanship trainer in your area can help you with training your horse to give to the pressure of a rope around a leg. My horse has avoided injury many times because she has been trained to move away from pressure instead of following her instinct to push into pressure. Horses trained this way are more likely to stand calmly and wait for help when they step into wire or other hazards instead of fighting and causing themselves injury.